I spoke with Dionne on livechat to receive two quotes I needed for a client. He was extremely helpful and informative in assisting me to ensure I had the right products. I was unsure about a few details, but he put my mind at ease with his knowledge of your company's offers and resolved each of my questions. I just wanted to reach out and inform you that I appreciate working with someone with such a positive work ethic. I wanted to share that my experience with you yesterday was exemplary and restored my faith in US corporate customer service. You were positive, articulate, very knowledgeable and extremely helpful. Yesterday was a challenging day for me but that interaction was a little ray of sunshine in my day. I actually got off the phone with you with a smile on my face because you helped me solve a problem. Thank you. It is a good motivator for me to agitate for much better process and training for our own customer service team. I’m confident the solution you helped me develop for our little sign project will work perfectly and, when it does, I’ll place our order next week for the full quantity of standoffs to complete this job. Please pass this along up the tree to whomever you want to. You deserve props from your superiors. Thank you, again. Have a great day. I wanted to let you know, first of all, that we think you have a great business. We have had almost no issues with your products or your people in the time that we have been purchasing from you. We did, briefly, have some shipping issues, but that was resolved quickly…. Anyway… that is not why I am shooting you this email. I am just finishing a large job, at least for us, that required come custom standoffs. Dionne worked with me throughout the design and ordering process. When the customer changed the design a bit and we needed additional custom standoffs, she was extremely helpful in getting the order in to your factory and back out to me in the quickest time possible. In short, she made me look really good with my customer. This is the first time that I worked with Dionne on an extensive basis. She was courteous, polite, helpful and professional throughout and I wanted to make sure you know what a great representative she is for you company. I wanted to let you know we finally received the pieces you sent us and they turned out fantastic .. just a big thank you and especially for the ‘exceptional’ service you provided throughout the order. Wishing you the best and until next time .. Thank you for exceptional customer service. I see very little of this level of quality work from vendors. Demar, I wanted to take a moment to send a very sincere thank you for the professional way you handled this difficult and unusual request. I had spent an hour searching the internet for this application and you were the ONLY firm that answered my questions. Your personal knowledge of the product and skill in describing how to install it left me feeling that I was dealing with a professional person with skill and experience. Thanks again and please use me for a reference!, I look forward to getting the units installed and sending you photos! Thank you so much for all your help you are a great asset to your company and there way of doing business. I will most definately share your company with my friends in the Awards and All Recognition business. 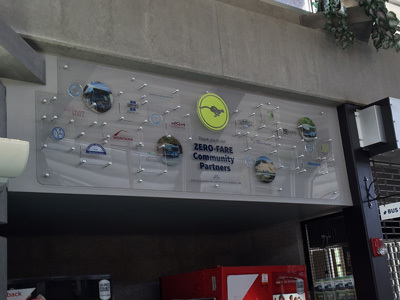 Here is a photo of the Zero-Fare display. Thanks for all the help with the standoffs! Package Arrived. Thanks and good job. After searching on line for a good while I landed on your web site and ordered. Glad I did. The experience turned out successful. Keep it up. I am duly impressed with not only Mbs but your personal follow-through as well. You folks did what you said you would do in the timeframe you said you would do it within. Thank you very much for outstanding customer service... It is appreciated. We just received the order. I just want to take a few minutes to thank you for your excellent customer services. Just received the standoffs you shipped two days ago from across the country. Great service! Great Product! Amazing Price!! Thank you for all your assistance. You are probably the most helpful representative I have had the pleasure in dealing with in years. Customer service seems to be secondary these days with a lot of suppliers. Thank you Marie for helping me complete my order. My sincere gratitude to you for expediting our order with care and efficiency on Friday, January 15th for 30 hooks for Peabody Art Association Members Group Show. They arrived the next day January 16th at 11:00 AM in time to hang all 80 pieces for the exhibit. So happy my husband found you! You did a great job! I have ordered a lot in my life and you have made it very EASY. Now that is what I call quality control!!! I showed to our warehouse manager and he said he is sorry. He saw the boxes and didn’t realize they had the missing screws. Thanks for showing this to me, I wish we had that system here!!! Thank you very much for your prompt attention. I wish all of my vendors were as quick as you! Perfect! Thank you so much. I can tell you love your job. Your customer service skills are fabulous!!! You are so helpful! I really appreciate you! Have a wonderful weekend Travis, my hero! I just wanted to say how impressed I was with your website and transaction process. My career is in online advertising and web development and compared to your competitors (G… resellers and N...?) you are killing it.Super smart upsell/recommendation to add necessary hardware in screws and anchors. I found that confusing on other sites to know what was and wasn't included in the cost in terms of anchoring items. 1, 2, 3 with you all and done. I looked at you for Price to start but your site experience sealed the deal. Appreciate it. Super!! Thanks for making things work, as always! These standoffs worked out great! My customer is wanting to add another sign, they loved the first one so much! I just received my order from your company and it’s is exactly what I was looking for. We were getting 1-1/4”X1” aluminum from Displays to go but they seem to have run out for the past year and it put us in a bind with regards to staying consistent throughout our school when we install new signage. I love the flat side, it’s perfect for what we need. Your team is very fast and we appreciate that.This was our first time ordering from your company but I can see you will be our new supplier for stand-offs for all our future orders. Received the package, and can't thank you enough! Thank you again for getting me out of a jam! Excellent service and turn-time as usual. Just wanted to let you all know how AWESOME these stand-offs have been for my small business manufacturing audiophile quality speaker enclosures. They made my grills look professional installed and detached. I thought you would like these since this is a really off the wall use of your product. I will be placing more orders in the future. Mbs Standoffs has some of the highest quality products in the industry. 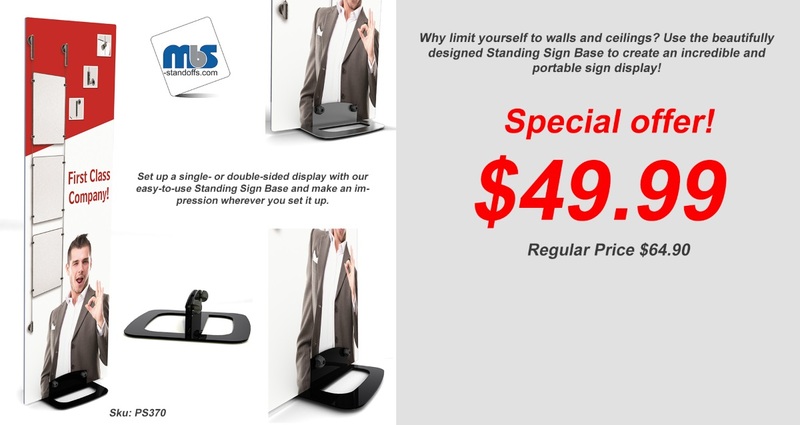 We use MBS every time we need standoffs or any mounting hardware. Along with the excellent products, MBS has always provided outstanding customer service in a timely and professional manner. I always have my order within a day or two and that is crucial when working on time-sensitive projects. Travis has been nothing but helpful with every order I place and any questions I have. The friendly, knowledgeable and reliable service is very much appreciated. We will continue to do business with Travis and MBS for the foreseeable future. A wonderful vendor all around. Just got the confirmation, I really like the new style and layout for the confirmations, much easier for me to read. MBS always seems to have it together and that is appreciated ! I have had such a positive experience working with Bridget and the team at MBS that I look for ways to sell more stand offs to my customers. Every time I call, the sales staff is fantastic, kind, professional, and efficient. I always get the feeling that they care about me as a customer. They work really hard to make sure they recommend the right product, hardware and tools needed to get the job done right the first time, which is invaluable to my business and the reason I choose MBS. It is always a pleasure to work with Demar and Mbs Standoffs. They have a quality product with terrific, competitive pricing. Response time is quicker than any other vendor we deal with, and shipping time is very fast as well. Our standoff vendor will always be MBS! YOU, are TREMENDOUS!!! Thank you so much for being so awesome!! Have a wonderful day and I will be in touch shortly. I did receive everything – thank you for the follow up. Our vendors are usually pretty good about responding. I don’t imagine it will take but a few days to us processed. The Shipment got sent to the old address but I caught it and fortunately know the Fedex Driver for that route and was able to contact him and arrange to meet him and pick it up. 5711 Halifax is the correct address moving forward. Thank you for the follow up. A significant part of our Business Model focuses on Customer Service. Our thought is that it can make you or break you. I appreciate the excellent way you’ve handled everything for us. Tell em to give you a raise! Got them this morning, everything was perfect, thanks for your prompt service, and excellent follow up. I will let you know the next time we need anything. Thank you Felicia, the standoffs are great! We are very happy with our order. Well hello Felicia! Everything went great, and all projects are out. Once again the installer picked up the finished product before I could get pictures. It has been crazy busy here. I am sure you will see our work soon. They are the Roxie the cow ads for Shamrock. We are shipping them all over. Also we have some things on our website we have done. prigraphics.com You have been a huge help and I appreciate you! You have been absolutely outstanding. I cannot thank you enough for your perseverance and your committment to customer service. I will look for my refund and thank you again. Would you like me to send you a picture of the finished project? I know they arrived. I have not been in my office today. Thank you for the great service. You have provided WONDERFUL customer service. It’s sincerely appreciated. Hey Felicia, I just received the standoffs. Thank you so much for your help. You are life saver. I just wanted to let you know. MBS is my one stop source for Stand Offs. I can just tell them what the project is and they can tell me exactly what is needed and what will work best. They always have product in stock, never a back order. My Representative, Travis, makes sure I get my quotes back within an hour. Each order is followed up with an acknowledgement and tracking. Bottom line, I never buy anywhere else! I can honestly say that I have experienced exceptional customer service from MBS since day one. The knowledge of all your customer service reps is second to none. I have chosen to always deal with Demar because of his personality and ease to work with. Last of all MBS’s extended hours are a plus. Looking forward to keep working with you in the future. We had a great experience with our order today. Bridget was able to understand what we needed, took the time to make sure we were getting the specific parts and followed up very quickly. Wish everything in business went this smoothly. Thank You Freida for making this transaction as easy as possible for me. I really appreciate all your help in getting this order correct. I can’t thank you enough. Have a Happy New Year!! Looking forward to doing more business with MBS. As a project manager, I am frequently in a position of needing to quote a specialty type job that requires some specific hardware applications for layered substrates, which I just could not figure out on my own.Freida is the absolute best at figuring out exactly my customer’s vision, and is also wonderful at suggesting other configurations that would work even better than what was originally designed.Her prompt attention and details are exactly what I’m looking for each and every time I need her help. Freida has saved me time (and, in turn, money) with her knowledge of the product, and what works best for particular applications, along with being an all-around great person to work with.I really value the opportunity to have Freida available as a resource for my project needs. Very nice to meet you! I must say I am absolutely impressed with your customer service team and products. Travis is WONDERFUL and he, amongst others I’ve worked with from Mbs Standoffs have exceeded my expectations. It is wonderful to be working with such a great team. Response time is phenomenal, the kindness and helpfulness I get from your team is exceptional… we are beyond satisfied! Jessica, thank you for looking into this for us. I really appreciate all your efforts. Just let me know when you get this final cost and lead time. I did not expect a response that quick. Send me the 6 lengths and if you need a credit card just call me or feel free to just bill us. It would be nice if we could get on a net 30 as we are trying to order more and more from you. Let me say again – I really appreciate working with you and MBS! Thank you for the follow up and great service! It is always a pleasure to work with Demar and Mbs Standoffs. They have a quality product with terrific, competitive pricing. and shipping time is very fast as well. Our standoff vendor will always be MBS! I feel like we just left and came right back. Thank you and your Team for all your hard work and making things happen on Friday! I went ahead and ordered online. Thank you so much for all your help! Hope to do business with you in the future. This may not be much a bang to end the day! We have been using one of your competitors for the longest time.. going forward we will definitely go with you! You are so awesome! Thank you. Thanks for your help on the phone with this and I look forward to working with you. Thanks for your help with my latest order (MBS18567) and the quick delivery. Happy Halloween! Thank you so much for your help. The extras are a great idea. I am sure that our customer will appreciate them. You guys are the BEST! You are a miracle worker!!!! We will use four stand-offs per sign and I’m relying on you for size recommendation. They are for plaques – the bigger sign will hang on a public building wall and the smaller one will be a copy for the person being honored to keep in his home either on a wall or on a stand. When you have a recommendation, please send it to me and call me for the credit card info. I have the card right by the phone to give you the info whenever you are ready. Thank you for helping me and have a GREAT, Great, GREAT weekend – you’re the BEST!!!!!! Happy Monday! I feel like we just left and came right back. Thank you and your Team for all your hard work and making things happen on Friday! I look forward to working with you all. Have a great week. Hello Jessica, we received the sample pack of standoffs you sent us on Monday. They look really good and probably will be placing our first order for a couple hundred soon. Wow, that was fast! You are the best!!! Thanks for your quote. I will see what my customer decides to do, and if he does stand offs for sure I will be contacting you. I really appreciate the time you took with me to discuss potential issues, and know your product well enough to ask me what thickness of plaque I was going to use so you offered me what will work with the stud length. Anyway I also hope to assist my customers well with plaque info I have to them. Just know I thought you did a great job, and appreciate it! Thanks for your exceptional follow up and detailed quotes. Your service is extraordinary. This quote looks good. I'll need to determine exactly what my needs are after meeting with the gallery installing my work. I should know this at the latest early next week. I will then place an order for the items needed. Hopefully we can combine everything into one shipment to minimized that cost. Thank you very much for helping with my order. The transaction was easy, you were very professional and polite to speak with. These days that goes along way! Have a wonderful weekend! Again, thank you for the outstanding service! I just wanted to drop you a line and tell you that I have received my order and I must say that I am very happy and impressed with you products quality and the the way it was packaged and received. To many times we deal with suppliers and are dis-appointed when the order arrives but this was certainly not the case. Great job!!! It was Wednesday when you sent them and they arrived Monday morning! Very impressed with the quality and will be introducing them on our site soon so lets hope we do lots of business with them! Will keep you in touch how things develop, thanks for your help and thank Emilio he has been very helpful. Thanks for the follow up, Jessica. Very happy with your products and will continue to keep an eye out for new products through your website…Thanks again! !